Earlier this year, I interviewed Norman Blake of Teenage Fanclub for an installment of Random Rules. Blake was warm, forthcoming, and totally geeky about the music that popped up on his iPod. As it turned out, he and I have a lot of overlapping favorites (Buzzcocks, Wire, The Cramps, Jonathan Richman). But when he hit shuffle and came up with a band called Honeybus, I drew a total blank. Blake filled me in: The group had a hit in England in 1968 with the song “I Can’t Let Maggie Go,” and in spite of a few more minor successes, they faded away in the early ’70s, leaving behind a catalog of sumptuous pop like 1970’s Story, which was reissued in 2008 (with Blake’s assistance) by Rev-Ola Records. I’ve been a huge fan of ’60s rock in all its incarnations since I was a kid, and Honeybus is exactly the kind of group I gravitate toward most. Yet somehow, it had totally evaded my radar. After the interview, I tracked down Story; six months later, it already feels like an old friend. This summer, I attended Whiting, Indiana’s annual Pierogi Fest, which is pretty much the best event in the history of time. On the warm summer evening drive home to Chicago, eating pierogi out of a Styrofoam box with my hands, I didn’t think the night could get more pleasant, until the song “Home” by Edward Sharpe And The Magnetic Zeroes came on the radio. The song is almost too joyful and up-with-people for a couple of sour apples like my husband and me, but at the moment, it was just what we needed. I thought it was a recent release, until I learned it was a big hit in 2009. I’m not ready to commit to the band as a whole yet as a personal favorite, but that 2009 song helped form a nice 2010 memory. Though I wonder if any song would feel special if it was accompanied by melted butter. I was doing some research on the year 1981 for something A.V. Club-related (stay tuned) when I took a look at some old Top 10 lists from that year. One of them was a singles list featuring Lindsey Buckingham’s “Trouble,” from his first solo album—a song I knew before and had always had somewhere in the back of my head without ever having done anything about it. This time I did, and if my iTunes stats indicate anything, I haven’t stopped playing it since. It’s perfect—haunting, full-sounding, but minimalist lyrically and vocally, like headphone candy. A friend who keeps track of these things pointed me to a disco re-edit of the track that works nicely, but the original keeps snagging me back for another listen. As I was thinking about my favorite albums of 2010 for this year’s list, I felt a slight pang of regret that one of the discs I listened to most in 2010 actually came out in late 2009, so I couldn’t give it the props it deserves. (Because if there’s anything I have to share with the world, it’s props.) Anyway: You Are The One I Pick by Felix, a band I’d never heard of and didn’t hear much about, even after obsessively spinning the record through the early months of this year. It’s a gorgeous, austere, weird, wonderful set of songs that has a sort of classic singer-songwriter vibe at its core—think Joni Mitchell—but quickly bursts out of that shell with little digressions. Erik Satie meets Cat Power? Perhaps. There’s lots of piano and cello to complement Lucinda Chua’s voice and lyrics. Speaking of lyrics, is there a better song title anywhere than “Death To Everyone But Us”? Probably not. Here’s somebody’s fan video for that song. I’m not even going to talk about all the embarrassing stuff I hadn’t heard before. (Hi, Wowee Zowee!) Instead, I want to pimp The Sound’s Jeopardy, the first record by Adrian Borland’s second band. (He died in 1999; after struggling with severe depression for years, he threw himself under a train.) Borland’s first group was The Outsiders, who get credit for the first self-released UK punk LP. After two poorly reviewed albums, Borland went from punk to post: Jeopardy is a grab-bag of everything forward-moving in 1980 Britain, basically channeling everything around (especially Echo And The Bunnymen, which makes sense, considering how magpie-ish they could be) while sounding original in its songwriting. The opening, “I Can’t Escape Myself,” (cautious intro, slow build to cathartic chorus, repeat) runs right into a frantically keyboard-driven piece called “Heartland,” and later, there’s a sax-fueled freakout in “Words Fail Me” that wouldn’t be out of place on an Oingo Boingo album. The centerpiece is the five-minute monolith “Missiles,” with the angry chorus “WHO THE HELL BUILDS THOSE MISSILES?” It’s surprising that it hasn’t been exploited for a Cold War montage yet. Now that my home state of Wisconsin has settled into its annual bone-chilling freeze, I’ve been drawn back to two records that evoke expansive, all-encompassing desolation. The first is an old favorite, Wilco’s A Ghost Is Born, which never ceases to fry my nerve endings with Jeff Tweedy’s tales of personal apocalypse. (Plus, the torn-and-frayed fuzziness of his guitar sounds like how 10 degrees at 8 a.m. on a Monday morning feels.) The other record feels like an old favorite, but has actually only been in my collection for several months: John Fahey’s Death Chants, Breakdowns, And Military Waltzes. Fahey was a pioneering guitarist who emerged from the ’60s folk scene, but it seems reductive to place any single label on his music, as it was wide and deep enough to encompass all kinds of American and world musics, including Delta blues, Indian ragas, and forward-thinking experimental noise. Death Chants is a bit more on the traditional side, with Fahey demonstrating dazzling subtlety in country picking and blues styles. What really stands out for me is how heavy his guitar sounds—not in terms of volume, but sonic thickness and expressiveness. It sounds lonely, yet it draws from traditions that form the very fabric of a culture that binds us together. It’s music that warms the heart and chills the soul. When I write about music, it’s most frequently as an interviewer or a concert reviewer, which means my listening choices are often driven by forces other than what I might most like to listen to at any given moment. (For instance, I spent a week listening to Owl City.) That makes it tough for me to compile a year-end Top 10, but it also means that when I’m not on assignment, I’m free to let my interests roam. For some reason, I decided that this was the year to catch up on that dog., the long-defunct power-pop band led by Anna Waronker and Petra Haden, and I’ve spent many happy hours in the company of Róisín Murphy’s old band, Moloko. Rarely has a baritone sax swung the way it does in “Pure Pleasure Seeker,” from 2000’s Things to Make and Do. But as the parent of the world’s greatest 19-month-old—sorry, all other parents—my main musical obsession has been loading up our disused Nano with songs that a) she’ll love and b) we can stand. (One cathartic moment: Ripping the three-disc Sesame Street compilation Songs From The Street, then batch-deleting anything containing the word “Elmo.”) I’ve tapped out my eMusic account downloading Smithsonian Folkways collections of Woody Guthrie and Pete Seeger, as well as a fascinating two-volume set of Depression-era children’s fare called The Story That The Crow Told Me. But my favorites are the albums of Elizabeth Mitchell, who I’d only known as one of the core members of the indie-rock band Ida. On four albums with her husband, Ida’s Dan Littleton, and one with her former Brown roommate, Lisa Loeb, the former nursery-school teacher lends her pretty but unadorned voice to originals and classics like “You Are My Sunshine,” tapping into their sweet simplicity without veering into the cloying cheeriness that can make some music aimed at children sound downright creepy. (I’m looking at you, Wiggles.) Mitchell’s albums don’t condescend to kids or their parents; it’s safe to say that 2006’s You Are My Little Bird contains the only version of The Velvet Underground’s “What Goes On” aimed at the toddler set. Even after she’s tucked in her crib, mom and dad have been known to let the Nano play through dinnertime. Mitchell is perfect for listening to with kids, and perfect for unwinding after a day spent with them. For my birthday last year, a friend brought me a calendar taken from R. Crumb’s Heroes Of Blues, Jazz, & Country collector’s cards (and subsequent book). Each month, I’ve made it a point to purchase some music from the featured artist, except for a couple of months when the artist was too obscure to leave much of a recorded history. Then I got the book and started exploring even further. While I thought I was pretty conversant in the basics of early-20th-century music, Crumb reminded me how much I didn’t know, particularly about early blues, and of the strange, wonderful wealth of music out there. So here’s to you, Barbecue Bob, Blind Lemon Jefferson, Bo Carter, Cannon’s Jug Stompers, Mississippi John Hurt, Papa Charlie Jackson, Rev. Gary Davis, Lucille Bogan, and others. Happy to have met you. Looking forward to spending more time together. Nothing musical is coming to mind, so I’m going to focus on a comedy album I discovered this year: Nine Sweaters by Andy Daly. Our readers likely know him even if they don’t recognize the name, as Daly has appeared in a multitude of films and TV shows, from Eastbound And Down to Yogi Bear, and he’s always one of the best things about them. He had the funniest track on the Comedy Death-Ray compilation from a few years back, and his album is just as funny. It isn’t a traditional stand-up album per se; he appears as a different character in each of the nine tracks. That may sound shticky, but it’s hilarious (and often hilariously dark): the wholesome sing-along leader who has a nasty run-in with a biker gang, the psychotic Irish storyteller, a hyper-sexual man who sees into the future, the son of a former TV star, the fantastically abrasive guy who runs a business livening up parties, and several more. They’re all pretty great—and Daly’s frequent appearances on Comedy Death-Ray Radio in character are like bonus tracks. You know how sometimes you can love a particular era of an artist so much that you have a hard time moving past it and exploring further? That’s been the case with me and Joni Mitchell for most of my adult life. I’d listened to the stretch of albums from 1971 to ’76 so much—Blue, For The Roses, Court And Spark, The Hissing Of Summer Lawns, and Hejira—that they’d become all I really wanted to hear from Mitchell. 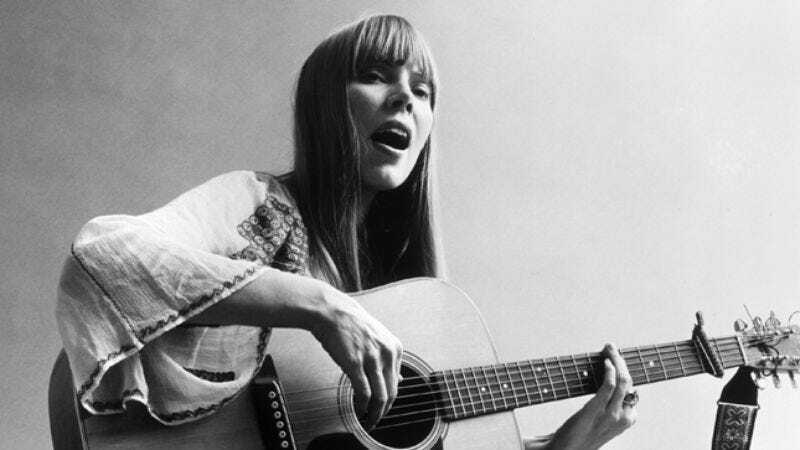 Every now and then, I’d pull out one of the ’60s or ’80s records and give them a spin, and I spent a lot of time with Shine when it came out in 2007, but if I wanted a Joni fix, I gravitated to the those prime pop-jazz-folk hybrids. This year, though, I went on a Joni Mitchell kick as the summer turned to fall, and gave the whole oeuvre a harder listen. My conclusion? I still love that five-album stretch the best, but I fell hard for 1982’s Wild Things Run Fast, the record Mitchell made under the influence of new wave. It still sounds jazzy, seductive, and thorny like the best of Joni Mitchell, but the songs are shorter and more rhythmic, with that rubbery smack that was the style in early-’80s pop production before the sound turned harder and more synthetic. And inspired by my renewed interest in Mitchell’s non-classic albums, I also dug deeper into the discography of Jaco Pastorius, the jazz wunderkind whose fretless bass helped make Hejira one of my favorite albums of all time. What I discovered—beside the revelation that Pastorius’ self-titled album is a masterpiece—is that the sound of one bass note alone is enough to transport me back to my childhood. What can I say? My parents were fusion fans. Living in Birmingham, Alabama in the mid-to-late ’90s, I remember when local band Verbena released its 1999 major-label debut, the Dave Grohl-produced Into The Pink. Sounding too much like Nirvana for its own good, the band didn’t make much of an impression on me at the time. Fast-forward more than 10 years later, and a friend who knew of Verbena and its Birmingham roots passed on to me a solo record from that band’s lead singer, Scott Bondy, a.k.a. AA Bondy. 2007’s American Hearts and 2009’s Shake the Devil Loose are works of intimate, dark, ramshackle blues-folk. The albums are a far cry from the hard-edged indie rock of Bondy’s original band, and songs like “A Slow Parade” and “World Without End” are as soulful and fragile as anything released in 2010. Few singer-songwriters are referred to as a “troubadour” anymore, but if anyone is worthy of the label, it’s Bondy. I’m a terrible music fan. I like what I like, and I rarely venture outside of what I know I like, even as what I know I like is fairly wide-ranging. But I do, occasionally, find myself so shamed by what my friends and colleagues enjoy that I finally bust out of my shell and try something new, usually enjoying it. Because I get most of my musical recommendations from the Internet and whatever ends up scoring my favorite TV shows, this means I end up enveloped in a lot of indie rock and pop, not that I mind. But I’ve been trying to branch out more and more, which is how 2010 became the year I kinda sorta got into Jay-Z. I’m still not completely well-versed in the guy’s music, but I really enjoy what I’ve heard of him, and The Blueprint is a phenomenal album. Granted, all of you knew this years and years and years ago, but hey, no one said I was timely.